I previously thought I had it working and posted some incorrect steps. It turns out that setting two-factor Client Cert/WS-Security authentication is not possible using a BasicHttp binding/adapter. So, I've updated the Solution section. Wow, where does the time go? I'm still writing 2013 on all my Dogecoin trans...no, bad joke. But honestly, how is it over half-way through January and I haven't written anything at all? Well, mostly it's because I've been busy trying to figure out to get client certificates to work with our BizTalk services. This was something that, all along, we just assumed would be a "flick-a-switch" type implementation. You'd think after so many disappointments, I'd have learned by now, there is no such thing in the world of BizTalk. oh, that must mean you can just provide both transport(client cert) and message security on this single dialog, yay! For now let's just use the message credentials part until we get the client certs issued. It greys out the cert related things, and just leaves message related credentials. Simple, just enter your username and password which the WCF is expecting and Bob's your uncle...client certs must be even easier! So now, we finally had our test client certs, I got the IIS server set up to trust all the right issuers, got the IIS Server cert setup, checked "Require" on the Client Certificates section in IIS configuration. I could reach the mex endpoint that's put up by the WCF service in a browser and choose the client cert from the service on which our BizTalk Send Port resides. 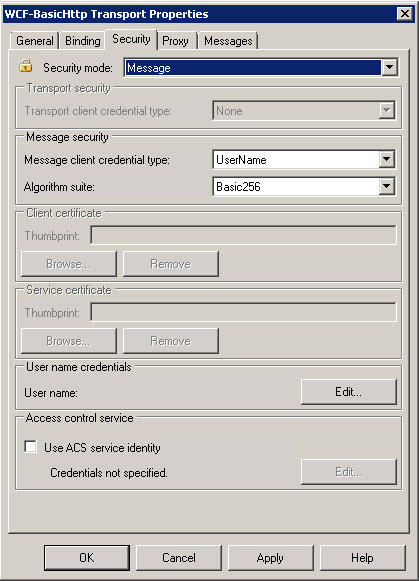 Then, I opened up our BizTalk solution to the same WCF-BasicHttp properties page again and switched to TransportWithMessageCredential, thinking all I would have to do is supply a client cert using the that handy looking browse button...Wrong! It's hard to tell, but I did change the security mode in the screenshot above...but nothing else changed. So basically you can't supply a cert here, the handy dandy browse button turns out to be only for when you choose Transport security with a "Transport client credential type:" of Certificate. Now that I can start to understand what is actually going on in my situation, it makes a bit more sense why the security page does not allow an SSL client cert AND message credentials. It's because this particular tab applies only to message security. 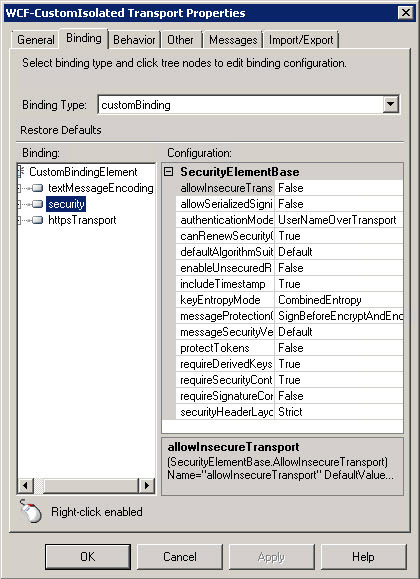 The Transport part of TransportWithMessageCredential is just saying, there will be Transport-Layer security of some sort, but it's not being handled by BizTalk, however, BizTalk will be expecting it. This tab has nothing to do with the HTTP/IIS layer of security. You want to change the actual Transport-Layer/HTTP endpoint settings, you need to create new Send and Receive Ports that use the WCF-Custom adapter combined with a customBinding endpoint binding. First off we need to update the Receive Location to use the WCF-CustomIsolated Adapter. This signifies that this WCF service will be using a Custom binding that is also being hosted on Isolated Host, such as IIS. Edit the Receive Location in the the BizTalk Admin console, choose WCF-CustomIsolated for the Type and click Configure. Set the textMessageEncoding --> messageVersion attribute to "Soap11" because Default value is Soap 1.2 (unless you want to use Soap 1.2). 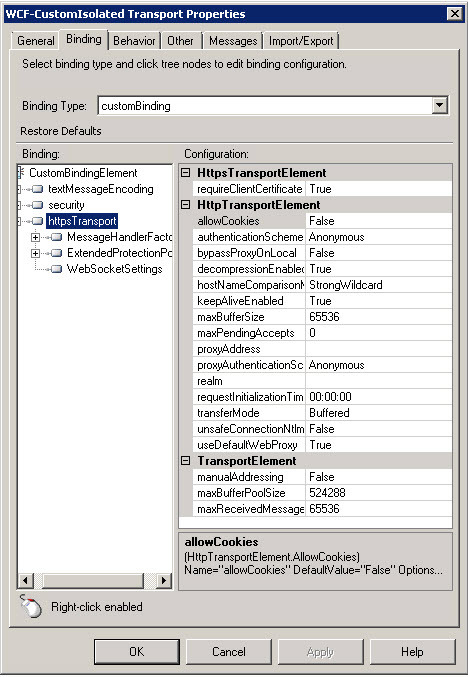 the httpsTransport element has an attribute named requireClientCertificate this should be set to "true" everything else is left with the defaults. then you can add whatever behaviors are necessary for your service. For me, I needed to allow useRequestHeadersForMetadata because I'm behind a TMG, as well as allowing https Get for mex data. after that, if this is being added to a WCF service which already exists, you have to go into the the web storage directory (wwwroot/myService) and edit the .svc file in order to handle the WCF-CustomIsolated adapter. This section is only necessary if you not only need to use a Receive Port as outlined above, but ALSO need to call that WCF service from another BizTalk Application/Send Port. I'll outline in detail how to get the client cert attached and have the Send Port sending to the Receive port (well, it's WCF service). For the most part, the configuration is nearly the same as for the Receive Port, except for a few different steps that are needed in order to get the Client Certificate and Message Credentials flowing. On the Binding tab, just repeat steps 1 - 10 from the Receive port instructions above. 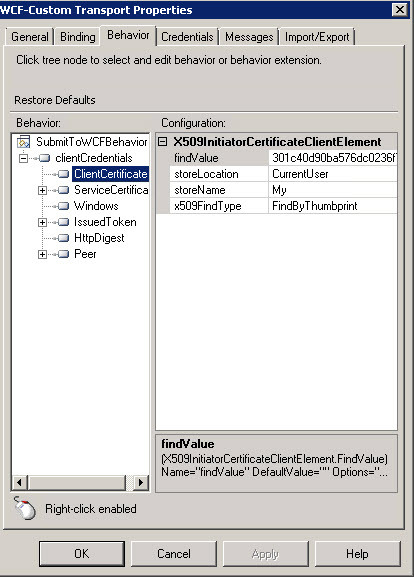 Right-click on the Behavior root element and choose "Add extension"
In the right side pane is where you enter your parameters for finding the client cert in the store. As shown above I'm checking the "CurrentUser" and finding using the thumbprint of the cert (FindByThumbprint which is in the System.Security.Cryptography.X509Certificates.X509FindType System.Security.Cryptography.X509Certificates.X509FindType enumeration)...the thumbprint can be entered with or without spaces and it still works. 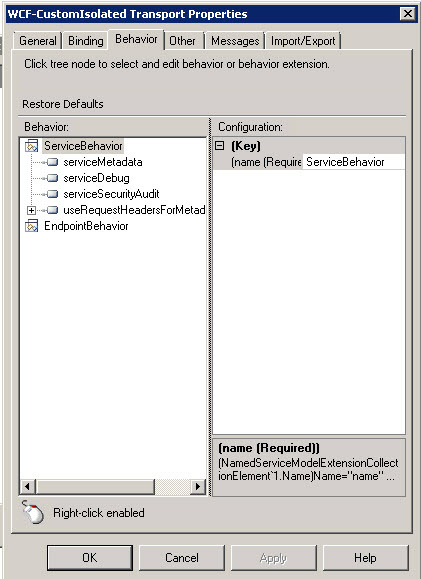 The "CurrentUser" referenced in the step above is actually the service account under which your Send Port is running. So you have to add the certificate to that user's store which is outlined here in more detail. Now move on to the Credentials Tab. There is were you choose "Do not user Single Sign-On" and enter the credentials for the Soap Header. Once that is all done, and your certificates are all in place, everything should work and the 2 BizTalk applications should be able to talk to each other with 2-level authentication. Before playing with Client Certificates (or any for that matter) and BizTalk, make sure you read up a little bit and prepare to be frustrated for the first run. Oh and remember -- the message-layer can't do everything. If you want to do this for a Non-BizTalk WCF service check out my write up on that for the details.